Just announced a few hours earlier today, the new Paradox Mods system brings official modding support to a wider set of players. This is quite important, as modding support for games can make them so much more interesting and having mods locked to one store really isn't great. Paradox Mods includes projects from recognized creators within the modding community such as Silva and ChoGGi, along with new creations from modders known in other Paradox game communities. Players now have even more ways to enjoy the survival strategy sim whether it’s adding a self-sufficient Forest Greenhouse or building a Martian Car Wash. 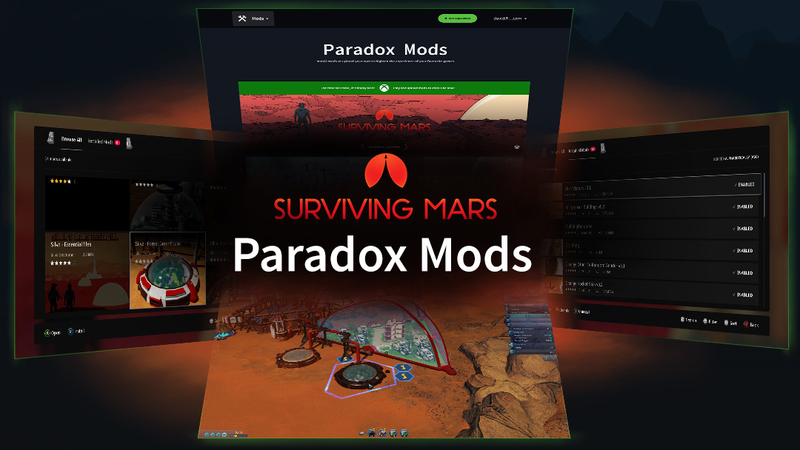 Simply log into your Paradox Account from the Surviving Mars title screen, open the “Mod Manager” at the bottom of the screen to browse the mods catalogue, then select mods that you want to play and the game will automatically download and add them to your playing experience. You can find their mod list here. Not only is this nice for everyone not on Steam, it tells us that they actually value all their players. As expected from Paradox though (and the developer Haemimont Games) as they support their titles well after release. Surviving Mars is no exception and I've had a lot of fun with it. If you don't own Surviving Mars, it's available on Humble Store, GOG, Paradox and Steam. So how does it actually work? Mod.io? Integration in launchers like GOG Galaxy? Sir_Diealot So how does it actually work? Mod.io? Integration in launchers like GOG Galaxy? As the quote notes, it's directly in the game and I linked to their mod website too. I find this really exciting. The Steam Workshop is quite convenient, but having mods limited to a single store and a single generic platform is limiting. People often mention that console versions of games don't have mods at all, which in my opinion is ridiculous. Having a single unified mod system for all the platforms they support is good for everyone. Plus, the Paradox Launcher is still in beta but they already have a Linux version, which is just great. Also, there are already Paradox mods that don't use the workshop (because they are too big), and problems with the workshop itself - sometimes it won't download the mods you want, or just the lack of a good versioning system (for games that update as frequently and drastically as Paradox titles, mod compatibility is a huge deal). For me this is one of the big draws of a Paradox launcher - mods could be managed in a much more sensible way, across different stores and all.